Create a project using plaid! You have TWO WEEKS to play along - Deadline to enter is Friday, November 4th, 2016 at Midnight CST. The winners will be announced on the NND blog. Post your project to your blog or to an online photo gallery such as Flickr, Pinterest, or splitcoaststampers (on splitcoast please use keywords newtonsnook and IPC37). Several of our Design Team Members decided to play along - check out all the awesome PLAID cards they created! Read the description below each card to see who made it. Samantha created a plaid background for her card using masks and inks! So cool! She created the city using images from the Newton Dreams of New York and Newton Dreams of London stamp sets and the sleigh and sentiment are from the Newton's Curious Christmas stamp set. Larissa created a sweet little shaker card with a fun plaid border! She used images from the Bushels of Love stamp set (Simon Says Stamp Exclusive). Adorable! 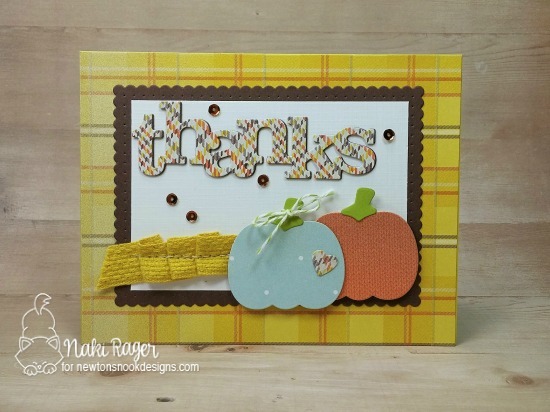 Naki created a fun fall thank you card using plaid paper and letters! She added in pumpkins cut out with the Pick-a-Pumpkin Die Set. That stitched ribbon is so pretty too! Yuki created a duo of adorable dog cards using dogs from our Canine Christmas stamp set with fun plaid backgrounds. The color combo on these cards of black, red, kraft and white is one of my favorites for Holiday cards! 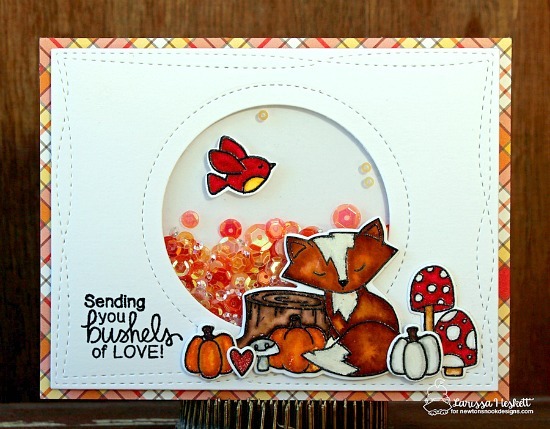 Danielle added plaid paper in fall colors to create this fun card! The angles of paper in the background are so fun! Winston from the Winston's Birthday stamp set really pops off the card! I pulled out one of my favorite christmas images, Winston driving a car laden with holiday goodies from the Winston's Home for Christmas Stamp Set. I colored the image with watercolors and then added plaid paper along with some black chalkboard style washi tape. I finished it off with the sentiment "have a beary merry christmas" embossed in white on a black circle. OMG!!!! Adorable cards!!! <3 Great challenge!!! All these inspirations are adorable!!! Love your stamps!! all cards are so cute! Love this challenge! Great inspirational projects! Thanks for the FUN plaid challenge and awesome inspiration! As always thanks so much for the inspiration and amazing cards! 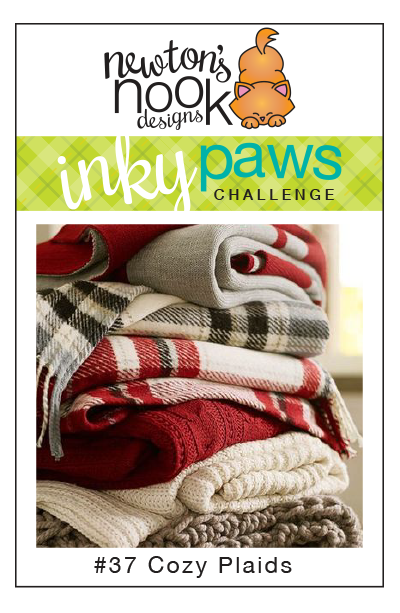 I like Inky Paws Challenges! They are always so much fun!